Collecting a few Flavorah-based recipes here for reference. By the way, I renamed Flavorah from “FLV” to “Flavorah”! I think some can already be found with a search for Flavorah. This turned out to be a great Shake-n-Vape. These FLV flavors (so far) are extremely potent! Love the flavor of this Lime and the Cream is very very smooth. This is a good shake and vape, the wild melon is the best melon I’ve tried and the sweet coconut is very tasty as well. I’ve had one person from this forum provide feedback. If you are not a banana fan you probably won’t like this. If you do like it I would say you’d love it. I’m calling it Monkey Nuts and encourage anyone interested to go to Flavorah’s Website and get some flavors, including their peanut butter and banana so you can try this one. For my tastes it gets 5 stars. 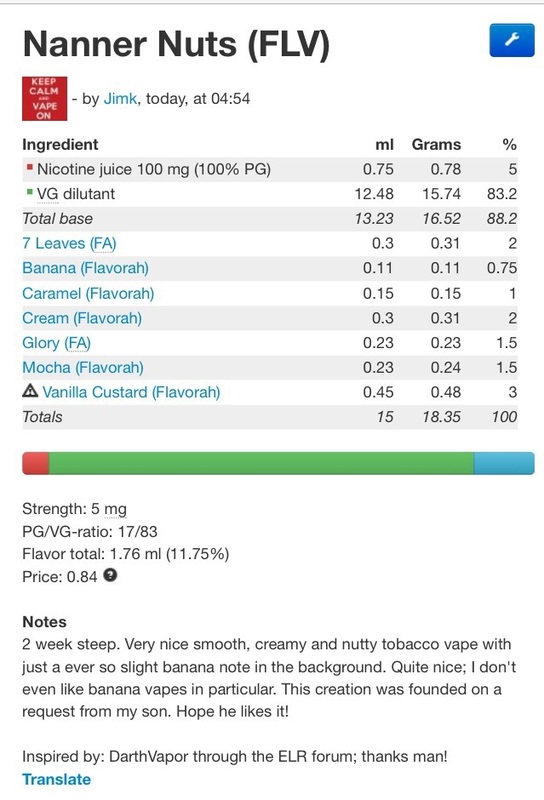 Got this email today saying Vanilla Custard is back in stock at the Flavorah web store. What the crap is going on? Can you not get Vanilla Custard in the 15ml bottle, that is the one I put my email address in for when it was back in stock. Just got the email today. Vanilla Custard is in stock in 15 ml bottles. Apparently, you can “copy as html (text)” and paste in the forums now. Just FYI. Looks good @JoJo. I had moved away from Strawberry vapes, but lately I’ve been finding them quite appealing. I’ll give yours a whirl. Thanks for sharing. That looks pretty good. I will try that out and finally use some of that banana. Surprisingly, not a bad banana flavor at low percentages. Who knew? For some reason, that option is not offered to me under the blue wrench when I’m on my phone or I would be using that option; I’m hardly ever at my iMac…always on my phone for internet stuff. But thanks for the info anyway! S’okay…I like pretty screen shots and pictures. Remember to rate it at e-liquid-recipes.com! This Juice is all right but I will use a different Virginia next time. Flavorah has a very good selection of flavour but their tobacco's need improvement. Since they only carry two, it is probably not a priority for them. One of my Startrek juices, I think it could do with some Perique Black, that would go nicely with this. This one is nice and spicy, not Hades’s whip hot but I found that one too much for my taste. You will have to change your cotton after this one though. Nice line up! gonna be mixing up the Vulcan Fire for the wife today. She loves her spicy vapes! …you got that right! Learned my lesson on that one…don’t screw with the wife’s eJuice or there’s hell to pay! Hell hath no fury like a woman scorned!